On Thursday, I went to a Moms’ Night In at a friend’s. It was Craft Night, meaning everyone was to bring a craft to work on (or knitting or whatever) meaning that we basically stood around talking, eating, and drinking and doing very little in the way of crafting. Typical MNI. I did manage to complete two more rows of my second Interminable Knitting Project; I basically only work on it during Knitting Nights (once a month or less), or events like these. Sometimes, so much time elapses that I forget how to knit. I’m hoping to finish this hat by next winter. I hope it will still fit my son’s head. Everyone was tasked to bring food, as we always do. I had a brand-new jar of pesto, and I recalled Pinning this recipe some months ago, from a blog called Three More Big Bites. Below is their photo; so pretty. It was, in fact, so easy that I could recall the ingredients without looking the recipe up again. 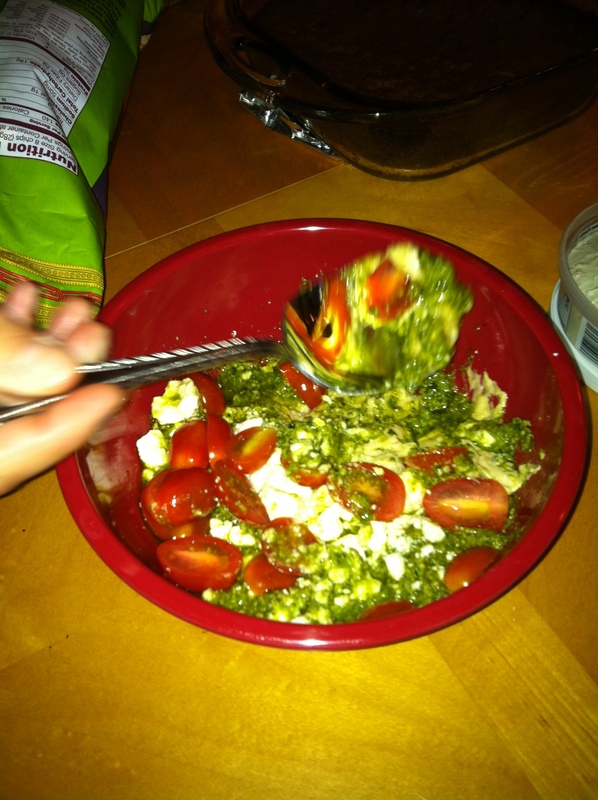 Hummus on the bottom, pesto, then feta and halved grape tomatoes. I was at Trader Joe’s and saw some gluten-free quinoa/black bean tortilla chips and, remembering one in our group must eat gluten free, picked those up along with the hummus, cheese, and tomatoes. They were only $2.69, and very tasty too. At the gathering, I unveiled the dip. It was delicious. The other women all came over to try it, and agreed. Eventually I remembered to take a photo, so I broke my way through the bodies forming a stockade around the bowl to snap this. Even then, I got an action shot. (Also, I should take these women with me to big sales. Imagine how forceful they’d be). I did not have to take any home. This will probably become a staple. Next up, Pinterest Night, where someone wants us to empty (read: drink it all) her tequila bottle so she can cut it using acetone, string, and fire. No one’s done it, everyone’s pinned it. Probably not to be attempted after the shots, though that would make it infinitely more exciting. I’m obsessed with those quinoa black bean chips from TJs. They are so good! And that dish looks heavenly.